I will listen to these tracks and maybe comment what I think after. For now, I read that you mentioned that Toni Cavanaugh was in a band called ‘The Bats’. Very briefly, Stuart Sutcliffe was in this group as a bassist, in the beginning of 1962, before he died, according to Astrid, his girlfriend. Apparently Stu had not entirely decided to quit rock ‘n roll music entirely for his art before he died tragically in April of 1962. Also, Toni Cavanaugh may be the drummer on some of the ‘Beat Brothers’ tracks that feature Tony Sheridan singing, recorded for Bert Kaempfert, after the Beatles’ sessions as ‘Beat Brothers’ (interchangeable groups used to back Tony). I’m thinking of songs released on Carousel LP that I own which are not the Beatles, but are on the same double LP as Beatles tracks, like “My Bonnie” and “The Saints”. 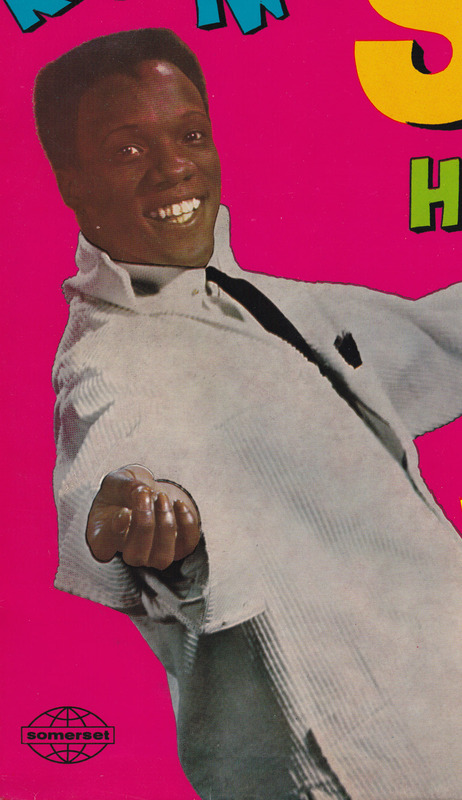 Some of these are “Skinny Minnie” and “Let’s Dance” which I think has Roy Hall on organ/piano. Anyway, thank you for posting this. I never would have heard it, as you say. Thanks. Glad you like the choice. Please comment on the tracks. I´m curious what you think. I didn´t know that Stuart Sutcliffe played in the Bats. Thanks for the info. 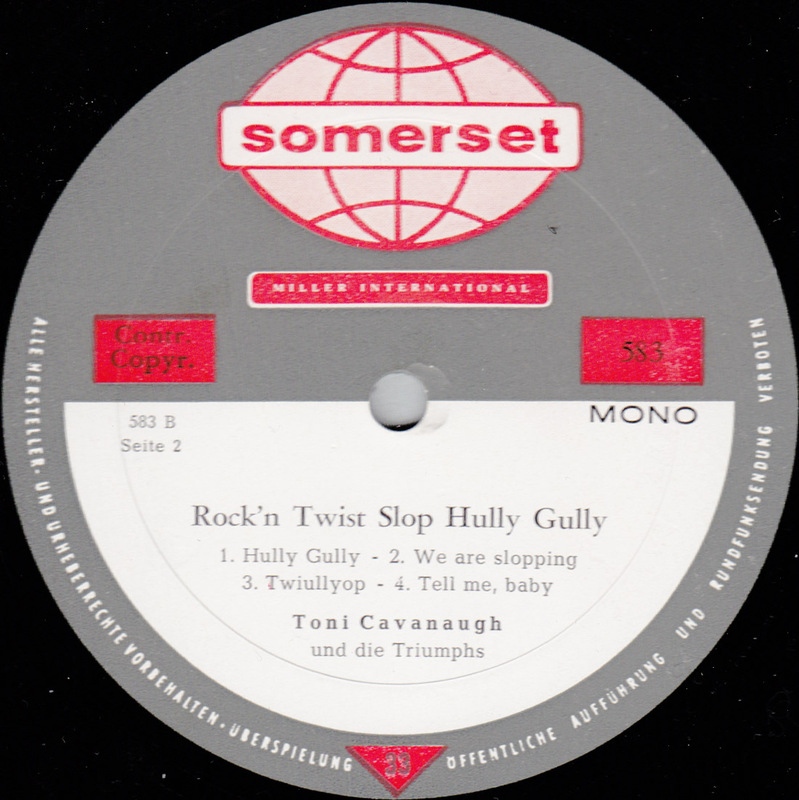 I think there were quite a number of Beat Brothers bands in Germany in the early 60´s though, so maybe the Tony Sheridan group was probably not identical with the Toni Cavanaugh group. The Tony groups? good morning italy! I was hoping you´d like this! it’ll make my soundtrack of the day, just turnin’ these gems into a great CDR…. zu b) habe den gestrigen Tag (1. Mai ,Tag der Arbeit) verunheiligt, um Sonntag Zeit für Tochter u. Enkel zu haben, habe dann jedoch von 18 – 20 Uhr wieder mit der hochinteressanten Gasdetektorhandbuchübersetzung aus dem Amerikanischen gekämpft; ich hoffe, Deine Arbeit hat etwas mit Zeichnen zu tun oder Publishing und ist somit aufregender…. Best version I’ve heard of this song. I like it better than the original by the Olympics. It’s hard to see anyone fighting to this version, as it is faster and less ‘Rumble Link Wray’ tempo, more like ‘Mach Schau’ fast rock ‘n roll tempo. 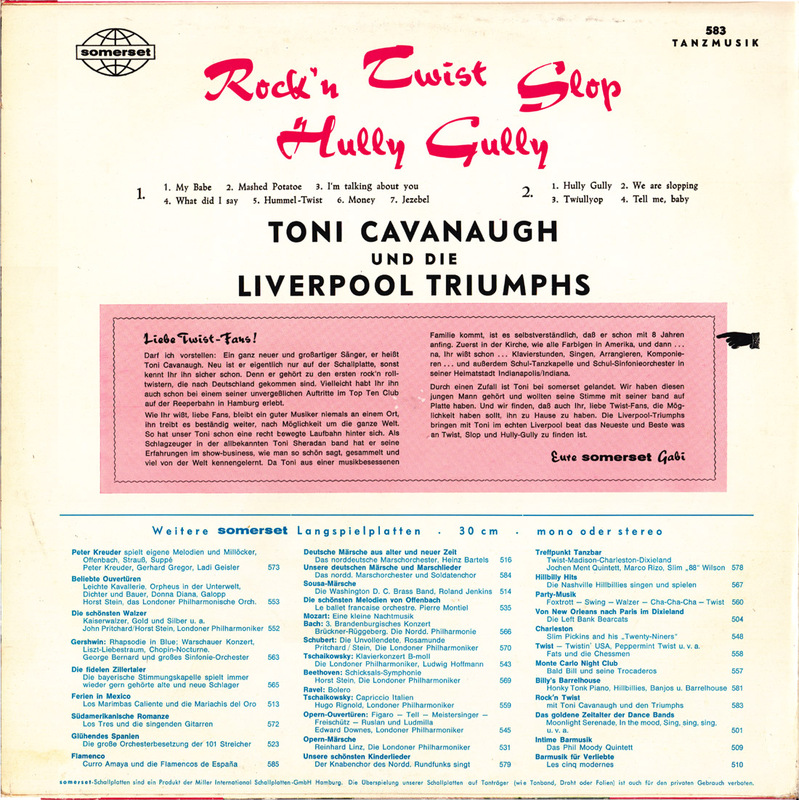 I’m sure this version by Toni Cavanaugh went over very well in Hamburg clubs. I particularly like the sort of improvisational ‘blabber’ Toni uses toward the end of the song, spurting out only bits and pieces of words. Great! I think he is like a Bobby Freeman in his intensity on this song. I’m spoiled by both Little Richard’s original and by The Beatles’ excellent cover version of this song, which are hard to beat. But Cavanaugh does a credible version. It’s not fantastic, but good. Again, not fantastic, but okay cover version. Certainly danceable. So far, a lot of these songs were also covered by The Beatles, Tony Sheridan & The Jets, other Liverpool groups too. These all must have become Hamburg favorites. This version has a straight-forward delivery, pretty decent. Ray Charles has the ultimate version of this, followed (in my opinion) by Tony Sheridan & The Beat Brothers (NOT the Beatles on that Polydor track however). The Beatles certainly did this number a LOT in St. Pauli too. 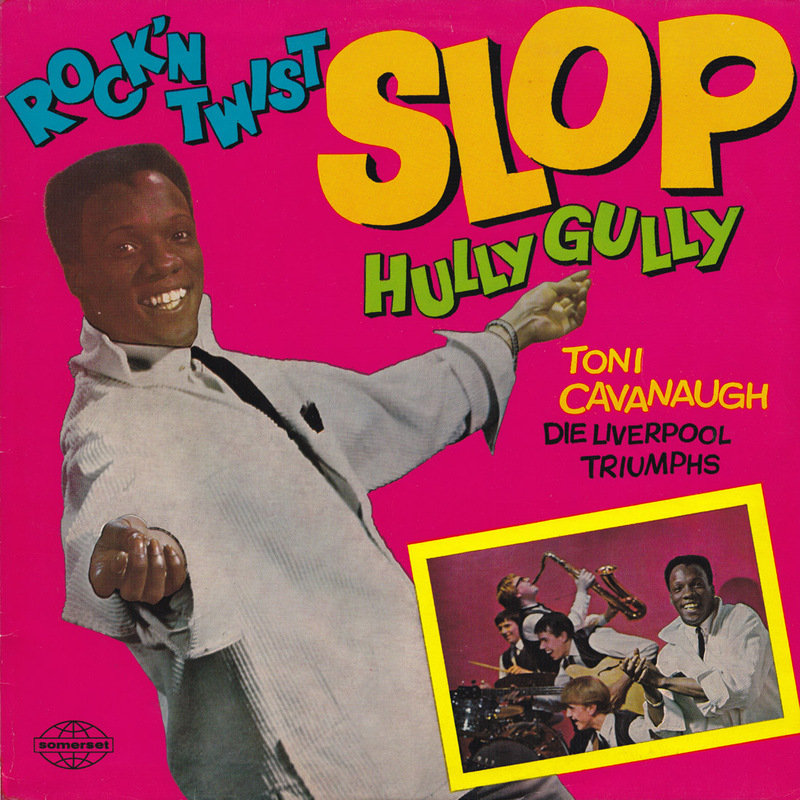 Cavanaugh’s version seems to borrow from Tony Sheridan/Eddie Cochran’s cover versions, but it is interesting in that Toni takes the white guys’ cover version and then makes it sound more ‘black’ again. It’s an interesting take on this classic song. I heard that Tony Sheridan and Paul McCartney have both said that this song was a great tune to play for an hour or so, continually improvising on, as they had to be on stage for such long hours every night. I never knew the story about “Klei di an’ n Mors”. Knowing this background makes this song sound more interesting. It is clear that Toni is trying to sing ‘auf deutsche’ and the audience really must have loved that he incorporated being an outlander or foreigner to the song. I’m surprised that the Beatles didn’t do this song in Hamburg. They would have had the Star Club screaming like crazy! I can picture John Lennon singing it too. Toni Cavanaugh is excellent in this. Should have been a 45 single release. Nobody has ever covered Barrett Strong’s version like this. Toni has a unique intro to the song, making it stand apart from all the other covers. It is spirited and I like it. Every version of this song, from Frankie Laine’s to Gene Vincent’s to Herman’s Hermits I have liked and it is one of my favorite songs. I once did an entire show on just this one song. This version is not the best, but I can’t help liking it as it is such a fantastic song. I really like Little Richard’s version, so I’m spoiled. This one is so-so for me. This is pretty good, and original, which I like. I’ll bet when Toni sang this live, it really rocked out more. Sometimes the studio versions don’t sound as great. The lyrics sound a bit like Chris Montez’s “Let’s Dance”. This I like also. I think the production could have been better in the studio, a pity because Toni Cavanaugh has talent that shines through even on the not so great production of this track. Thanks for posting these. I’m fascinated by Hamburg, what artists played there, what the scene must have been like. There are “World Heritage Sites” that I have been to, such as L’Anse aux Meadows in Newfoundland, where the Greenland Norse made a base camp that was preserved, or Cuzco, the imperial Inca city in Peru, etc. I think there should also be “Rock ‘n Roll Heritage Sites” where extremely important rock history was made too, such as Sun Records Studio in Memphis, Chess Studios in Chicago, CBGB’s in New York (which tragically was torn down and I could not believe it! ), and of course, Hamburg’s Reeperbahn and die Grosse Freiheit. These are places to preserve and to remember. Thank you so much for taking the time for these insightful comments! I agree on all points. It really is a LP that is worth to be re-released. Regarding “Rock´n´Roll Heritage Sites”, I think if the places initially have any integrity, they need to be not recognized in their time to make the biggest impact. It´s only a cool thing to go there, as long as mom and pop don´t think it is. But of course it´s still saddens me that a lot of the bars and clubs, where I spent some of the most memorable rock´n´roll moments of my life, have all been torn down. hi – in our book we have found out for the first time about the congrete dates Stuart played in the BATS with Tony. We have compiled all facts for the foreign fans – go to our website and you`ll find a pdf file for download. rocky roberts, hast du von dem auch was? Habe zuhause das Originalalbum. Ist immer noch einfach geil. Hi Andreas,Iplayed saxophone on Tonys album.It was recorded at the MusikHalle in Hamburg.The drummer was my old friend Aynsley Dunbar who is one of the worlds greatest drummers.The recording was made without a rehearsal from 2.00am through the night.The band were all very drunk.That was the only time we played with Tony.He had come to see us at the Tanz Club Party owned by Egon Rapp,at the recommendation of Paul Rogers,another friend from Liverpool who was a recording manager for Polydor.It was just a one off.The band was actually the Pressmen.At the time we were working under the name of the Flamingos as we had signed exclusive recording contracts with several companies,so we chose a different name for each one.We also recorded a single for Vogue records called “Mein Beatle Baby/Glucklich Wie Noch Nie”We also played the Star Club as Freddie Starr and the Midnighters,and the Starr Boys couple of times.Hamburg holds a special place in my heart.We always enjoyed our time there.